Dwight Eisenhower was the 34th President of the United States of America, the symbolic leader of the country. His presidency began in 1953 and ended in 1961. He was 62 years old when he first began his term of office on January 20, 1953. His birth name was David Dwight Eisenhower, after his father. To avoid confusion he was called by his middle name and eventually dropped his first name, David. His family nickname was 'Ike'. He had a variety of nicknames including General Ike and Kansas Cyclone. The strange nickname 'Duckpin' was due to his fondness for duckpin bowling. His prowess as a military general was reflected in one of his nicknames and his boyhood nickname led to his famous campaign slogan "I like Ike". The picture of Dwight Eisenhower portrays an interesting image of what this famous man looked like. The picture shows the clothing and the hairstyle that was fashionable during his presidency. He is described as being 5 feet 11 inches in height and 171 pounds in weight. He had blue colored eyes, a fair complexion and lost his light brown hair as he aged. He was short sighted, so sometimes wore glasses. His face would light up with his engaging smile. Dwight Eisenhower took pride in his appearance and was always neat and smartly dressed. Character and Personality Traits: What was Dwight Eisenhower like? The personality of Dwight Eisenhower is described as extrovert, optimistic, friendly and gregarious. He liked people and he wanted people to like him. He was honest and honorable and had the ability to inspire loyalty and respect in people. Although he was usually level headed he was also superstitious, ensuring that he carried three lucky coins in his trouser pockets. He was criticized for being evasive when required to ask unexpected questions. The important role and duties of the President of the United States of America include those of Chief of State, Chief Diplomat, Chief Executive, Commander in Chief, Legislative Leader and Leader of his own political party. What was Dwight Eisenhower famous for? Why was Dwight Eisenhower important? 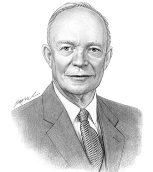 The history and life of President Dwight Eisenhower during his presidency is conveyed in the following fact file in an easy question and answer format. What President was Dwight Eisenhower? He was the 34th President of the United States of America. The dates of his presidency began in 1953 and ended in 1961 (January 20, 1953 to January 20, 1961). What was his political party? What other political offices did Dwight Eisenhower hold before his presidency? Who was his Vice President? What were the main events and the major accomplishments of his presidency? What was Dwight Eisenhower' nickname? His most famous nickname was "Ike"
Who was Dwight Eisenhower' s first lady? Dwight Eisenhower was famous for the events and accomplishments of his presidency, but what are the facts about the man and his private life. Facts and information about the private life of Dwight Eisenhower can be found in the following fact file in an easy question and answer format. When and where was Dwight Eisenhower born? What was the name of his father? What was the name of his mother? Where was Dwight Eisenhower educated and what was his religion? What did Dwight Eisenhower do before he became President of the United States? Who was Dwight Eisenhower' wife and when did they marry? Did they have kids? When did Dwight Eisenhower die? He died on March 28, 1969, in Washington, D.C.
We hope that the picture, facts and information on President Dwight Eisenhower will prove helpful to kids, school children and schools learning about the presidency of this famous American leader. The short biography of Dwight Eisenhower provides an overview of the President's character and personality traits. Watch the video and learn more about the major events of his life and his accomplishments. The following Dwight Eisenhower video is a useful educational resource for kids, children and schools learning about the life of the US President Dwight Eisenhower.